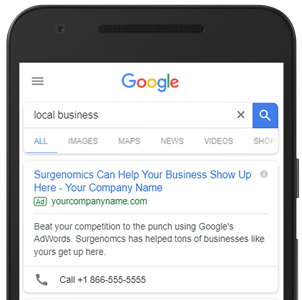 Are customers able to find you when they Google you? You’ve got a website and it’s got tons of original content. You’ve read all the articles on Google about how to get your website ranked up higher but it’s still showing up lower than your competitor’s website. So what do you do? Simple, you beat your competition using PPC advertising on Google AdWords. AdWords is an amazing Ad marketplace that lets you bid on a per customer basis. This means that you only pay for it if you get the visitor. Want to speak to someone that set it up for you? Once the research phase is complete, we make your ads and serve them on Search & Social networks.